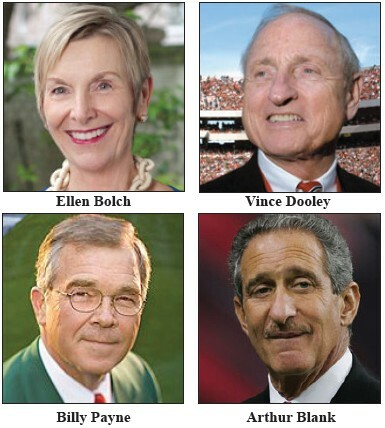 The Georgia Historical Society (GHS) announced recently that legendary UGA Coach Vince Dooley and Savannah philanthropist and businesswoman Ellen Bolch will preside over the 2014 Georgia Day Parade on Wednesday, February 12, 2014. The parade begins at 10:30 am. The route is along Bull St. from Forsyth Park to City Hall in Savannah. They will be joined by over two thousand elementary school students in colonial costume as well as students from Savannah Arts Academy and Beach High School ROTC as they make their way along Bull Street from Forsyth Park to City Hall. Mark your calendars and make plans to attend the 2014 Trustees Gala where you will experience “Mojo Nights”—a sultry, southern, spellbinding evening that highlights the appointment by Governor Nathan Deal of the 2014 Trustees, Arthur Blank and Billy Payne. The program includes lively conversation with the inductees and other local, state, and national leaders. The night will conclude with dancing to the rhythms of The Revelers. Saturday, February 15, 2014 at the Hyatt Regency Savannah.